Chic and easy wear for every day, these cigarette trousers with beautiful drape are cut in a fabric by the Italian Bonotto house. 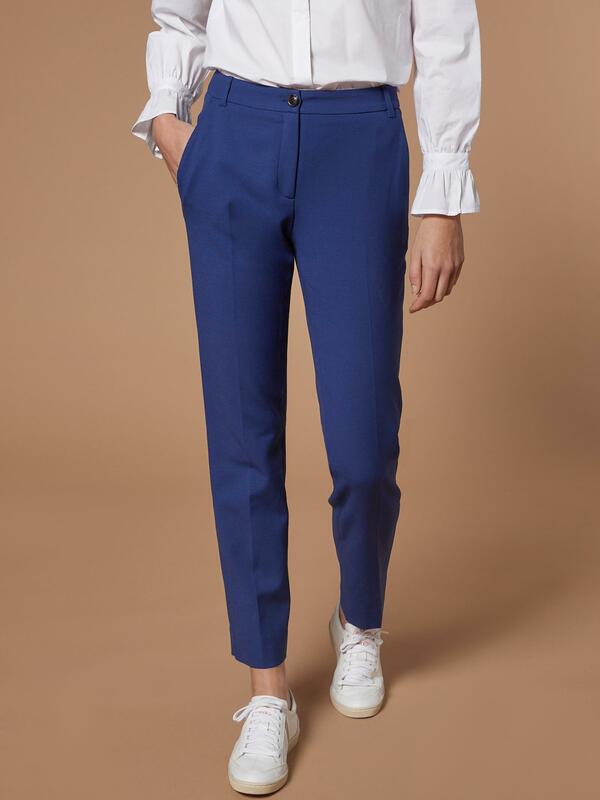 Their cropped and tapered style is sublime in navy. But it's in the orange option the moment's trendy and audacious shade that they shine! Can be worn as a total look with the matching jacket. Cigarette leg, cropped and tapered (7/8 length). Mid-rise waistband with belt loops, zip and button fastening. 2 slant front pockets. Mock piped pockets at back. Marked pleat front and back. Inseam 71cm, leg width 18.75cm approx. Milano knit, 80% polyester, 14% viscose, 6% elastane. Italian Bonotto fabric. Made in Europe. Top quality fabric from the Italian weaver Bonotto, a high-end textile company which counts among the most important and most appreciated in Italy and around the world.